Playing the Moon Game wins me a big prize in Luxor. I’ve taken trips where I’ve written down lots of information so I could identify the pictures I took. However, there was so much to absorb in Egypt that I just decided to experience being there, and count on having a few brochures I could read if I wished. However, with a limited understanding of the history of Egypt, it was easy to get confused as to which place we were visiting. I believe this is a temple in Luxor, but don’t quote me on that. All the people on our tour agreed that it was hard to distinguish one Pharaohs’ palace from another. Did this place honor Ramses II or Ramses III? Chances are that it was Ramses II because he lived into his nineties, which gave him more time to have monuments built for him. I liked the way in which our tour took in many of the monuments and antiquities first and then ended with the National Museum or Museum of Antiquities in Cairo. This is a national treasure with 120,000 objects, including the mummies of Egyptian pharaohs, sarcophagi, sculptures, furniture, etc. Best of all, it contains treasures from Tutankhamen’s tomb. We marveled at the skill and beauty of the objects buried with the pharaohs. 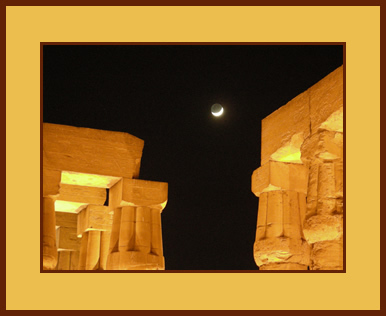 The reason this picture is titled “My Moon In Luxor” is because I “got” the moon that night. And if you don’t know what that means or how my husband and I have played the moon game for years, see It’s My Blue Moon.